There is no city that does street markets quite like London. There are over one hundred of them scattered about the city and we guarantee you’ll find something to tickle your fancy. If fashion is your thing, we’ve got you covered on where to head for bespoke vintage finds and new threads from local designers. Want to add some extra love to your holiday digs? We’ll give you the 411 on where to find the best flowers, as well as where to snag yourself some art and antiques for that brag wall (you know the one) once you get home. And don’t forget all that bloody good street food from just about every and any cuisine you can imagine. Think cheesy toasties with homemade kimchi, small and intricately assembled cakes, craft beers for wandering around with (you’re even allowed to drink in public in the UK), or jerked chicken handed straight to you from the smoking BBQ. Gather round team, you have some shopping to do. 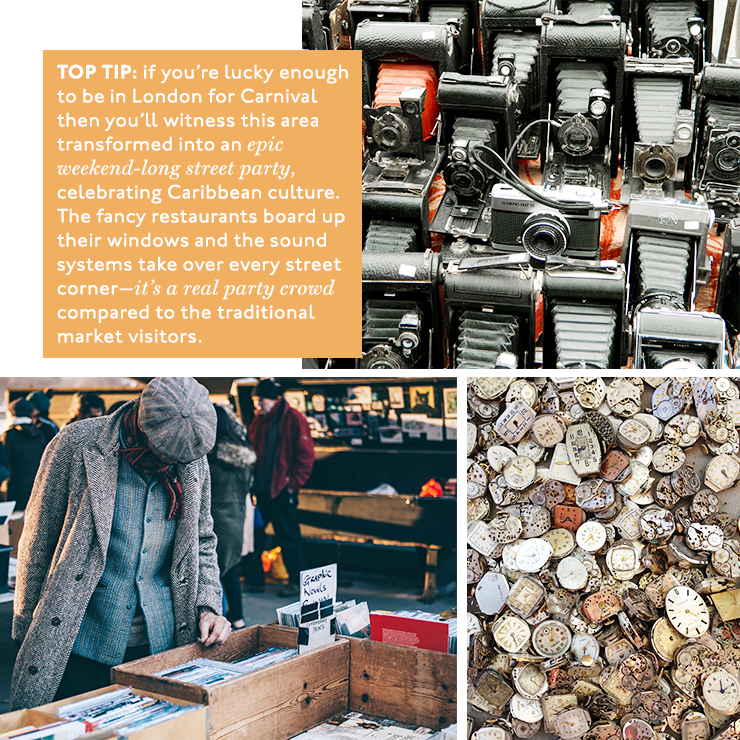 Here are the best markets in London to shop and Instagram to your heart’s content—or at least until you’ve blown your budget and used up all your roaming data. Brick Lane has it all. The entire stretch is covered in brilliant street art and the stalls that line the main drag are selling a whole heap of random trinkets. They also have a massive underground vintage clothes section (!! ), a giant shed full of artists selling their own contemporary clothes, and artwork as well as street food scattered about the entire Old Truman Brewery. Top Tip: We recommend you grab a snack to munch on (the pork buns are heavenly) while you decide what your main feast is going to be. That way you won’t just go for the first delicious thing you see and regret it for the rest of the day. Chances are you’ve heard a lot about Borough Market. Jamie Oliver loves it. Bridget Jones lived right next to it. Who wouldn’t want to follow in those illustrious footsteps? And once you step foot into this old fresh food market you’ll see exactly why it is so popular. 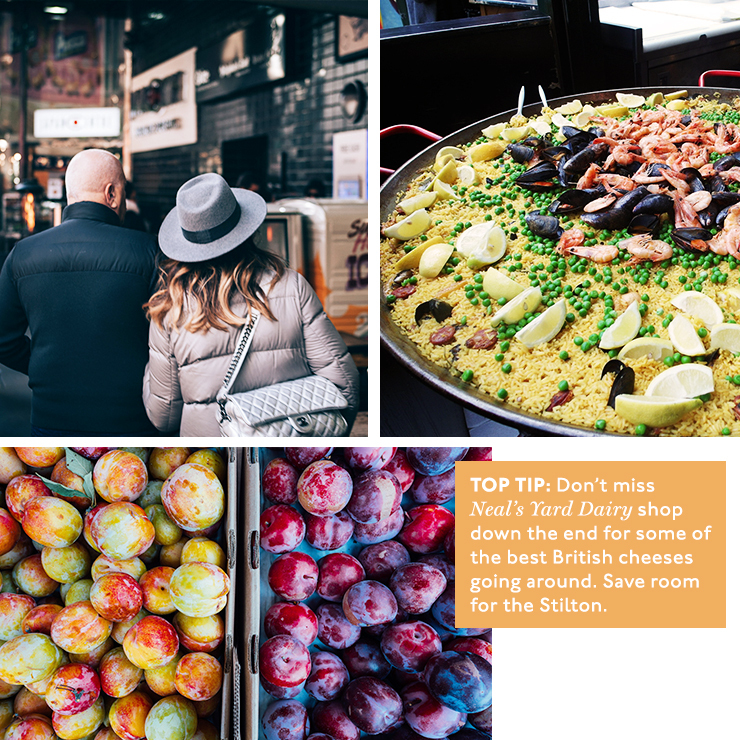 Buy all the best fresh fruit and veg (even if they are a bit overpriced) and eat from all the food stalls selling mussels stews, classic British pies, curries, bacon butties and all other kinds of deliciousness. Top Tip: Don’t miss Neal’s Yard Dairy shop down the end for some of the best British cheeses going around. Save room for the Stilton. This is an Instagrammer’s dream. The beautiful old street is lined with colourful shop windows and comes alive every Sunday when seasonal flowers burst out of all the crowded stalls. This narrow road can be a claustrophobic person’s greatest nightmare, but it’s well worth the stress. Even if you don’t buy any flower or plants, you’ll love the experience of hearing old cockney men yelling out ‘a bunch of daffodils for a fiver. These beauties will bright up any sad looking living room!’. It’s just a whole lot of fun. Top tip: If you have the time, head to the nearby Lily Vanilli bakery for some of the best cakes in London. You can’t go wrong when walking home with big and bright sunflowers in one hand and a blood orange cupcake in the other. Set down South in Bermondsey, this relatively new market is where you’ll find some of London’s best food and drink producers. They’ll be selling home-smoked fish, small batch gins and locally sourced cheeses. Take a stroll along the Ropewalk, stopping under some of the railway arches and then go to Spa Terminus to see where the original food traders have moved onto (and obviously sample their goods). Top tip: In London, the cool places to go are always changing. It looks as if Spa Terminus might just be the next big thing in the coming years. All romcom lovers will no doubt already be heading to Portobello Road for the famous blue door in Notting Hill, but you must stay out this way for the Sunday market. It’s an enormous antiques bazaar, boasting over 1,000 stalls selling all kinds of British collectables. You can also stop by on Saturdays for the fashion market, but the Sunday vibes are where it’s at for this West London institution. Top tip: if you’re lucky enough to be in London for Carnival then you’ll witness this area transformed into an epic weekend-long street party, celebrating Caribbean culture. The fancy restaurants board up their windows and the sound systems take over every street corner—it’s a real party crowd compared to the traditional market visitors. Broadway Market is a little bit out of the way. Which we love because it’s slightly distance locale keeps the crowds to a much more manageable level (compared to Borough Market which can be impossible to navigate on a weekend). You’ve got local artists selling their crafts, food stalls for days and some damn good coffee. We love coming to Broadway Market in summer, when we can sit in London Fields or on the Regent’s Canal and eat our street food while sipping on ciders. Top tip: Around the corner, you’ll also find Netil Market which has even more food, art, antiques and even its very own local radio station. Netil 360 is also the place to be in summer with its massive rooftop bar overlooking the entire city. This a brilliant alternative market. The street is far from being pretty and you won’t find any luxury goods here. In their place, you’ll get cheap and easy fruit, authentic Caribbean jerked chicken and a whole lot of random stuff that you wouldn’t expect to have its own dedicated stall. Some guys are selling their own mixed tapes, others have tables full of gold bling jewellery, and some slightly shady sourced clothes and rugs which may have just fallen off the back of a truck. It’s certainly a market worth experiencing. Just make sure you stay away from the questionable meat and fish shops. Top tip: We recommend to come back here on a weekend night for The Ridley Road Market Bar’s disco and RnB parties. They are too much fun. Camden is the home of all things punk. And you can find plenty of memorabilia from this era at Camden Market. There’s one totally bizarre shop with go-go dancers and glow in the dark, stilt walking shopkeepers which is worth a peak. Beyond that, you can wander around the market set within old horse stables and eat all manners of great Asian street food. Top tip: Grab some beers and sit by the nearby canal in the sun after you’ve purchased all sorts of souvenirs covered in the Union Jack. It’s the perfect spot to unwind after all that shopping. Unlike most others, Greenwich Market is open every day of the week. Again, you’ve got food, art, antiques, homewares, jewellery and fashion. It is also one of the most family friendly markets, with plenty of things for children. You’re also right by Greenwich park which overlooks the city, the famous Cutty Sark Ship, the Maritime Museum and some of the best pubs in London. Greenwich Market is the perfect addition to any South London exploring. Top tip: Head to the very top of Greenwich Park, which is just around the corner, for one of the best views over London. Differing from the other markets on the list, Brixton Village is mostly made up of permanent restaurants and cafes. You can wander about this maze of shops in South London which feels a bit like Degraves Street in Melbourne. Get a banging brunch at any of these places and a decent brew of coffee as well. 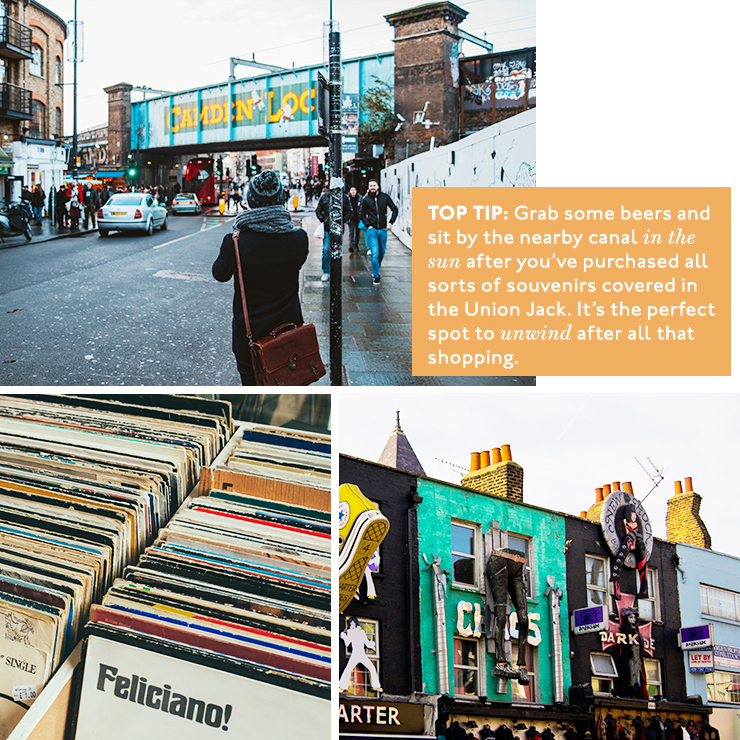 Top tip: The nearby Pop Brixton has a few decent pop-ups. It also plays host to some wickedly fun dress up parties and film screenings. The rooftop ain’t bad in summer either. Want more? Check out Where You Should Travel In 2018 Based On Your Star Sign.